On Monday night, the Edmonton Oilers played the Washington Capitals, a game which I figured was sure to be an offensive extravaganza, featuring goals, goal and more goals. I decided to track defensive performance in two very specific ways to see how the Oilers defended against one of the game’s best offensive teams. As it turned out, the answer was “extremely well” and the Caps were limited to just the one goal. That’s one more than the Oilers got, but as my primary focus was on the defence this is till going to be a pretty cheery piece. So, a quick explanation of the above chart is probably in order. On Monday, I sat and counted every time Washington attempted to gain Edmonton’s zone (at five-on-five) against an Oilers defenceman. Then I noted whether the defenceman managed to a) break-up the play, b) force a dump-in or c) allowed the Capitals to enter the zone with the puck. Pretty much everyone did pretty well, but the crazy thing here is how good Edmonton’s kids were at this. Brandon Davidson had the best results on the night, allowing just a single opposition entry on seven tries. Darnell Nurse and Oscar Klefbom either turned aside or forced a dump-in on 13 of 18 entry attempts, meaning that more than two out of three opposition rushes failed to secure the offensive zone. These are encouraging signs for these young players, who to a man are big, mobile, physical and naturally geared to defending the blue line. Mark Fayne and Andrej Sekera were less effective, but broke up the opposition entry on a combined seven of 21 tries, meaning that one in three Capitals rushes would fail even to get the puck deep, which is a minimal achievement. Oilers fans know from experience how turnovers at the offensive blue line can kill; their two veterans did a nice job of creating those against the Capitals. Only Eric Gryba had a bad night by this metric. It starts with Nate Schmidt behind his own net. He’s going to fire a long bank pass up the boards, triggering a two-man rush through the neutral zone by Washington. The pass is good and lands on Ovechkin’s stick. Fayne is on Ovechkin immediately, though, aggressively defending the blue line rather than sitting back conservatively. He’s able to place himself firmly between Ovechkin and the Oilers’ end, so Ovechkin flips the puck down towards the blue line, where hopefully Oshie can gain the zone with speed. Only it doesn’t happen that way. Klefbom gets to the puck first, and tips it to Benoit Pouliot, who is the high forward here. 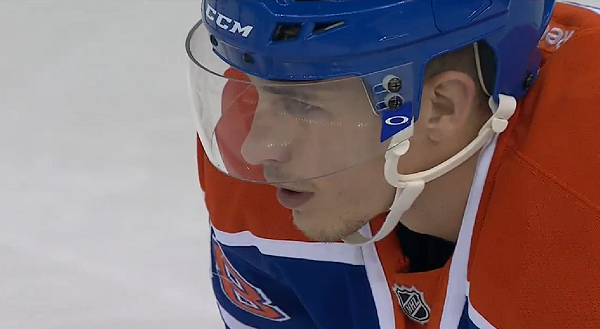 Pouliot gets the puck and makes a quick pass to Ryan Nugent-Hopkins, who is off to the races with Jordan Eberle. It’s a simple little play; all of four seconds elapse between the time Schmidt makes the initial pass and the moment when Pouliot wings the puck up ice to start the attack the other way. It’s just so perfect, and it shows nicely why defencemen are often best when they’re invisible. 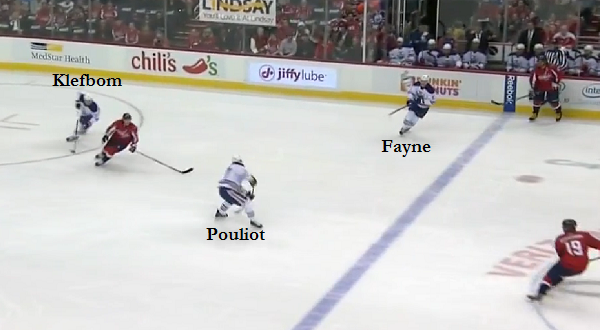 Ovechkin can’t do anything, because Fayne is right there, and there’s no reason to mentally flag the play. Oshie can’t do anything, because Klefbom is right there and there’s no reason to mentally flag the play. Pouliot is in good position and makes a quick pass, and again there’s no reason to remember the play because it all runs so quickly and so smoothly. This is a similar chart, but this time looking at how well defencemen performed at exiting the zone. A “possession” exit is one where the defenceman either carried or passed the puck out, while a chip exit is one of those desperation ‘toss the puck down the ice’ plays. Turnovers are self-explanatory. Again, all this is at five-on-five. 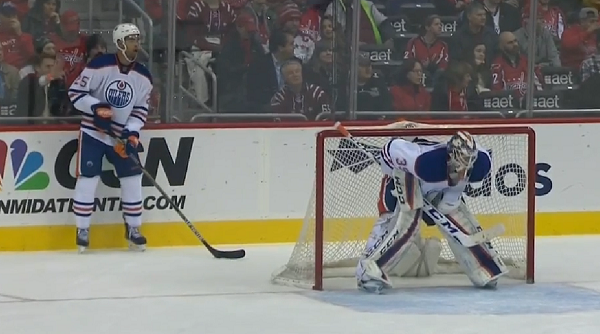 This is where Edmonton’s veterans really shone against Washington. Fayne surprised me because I don’t usually associate him with a good first pass, but he was a perfect six-for-six by my count on the night. Sekera didn’t surprise me at all; he’s really good at this pretty much every night and doesn’t get enough credit for it. The kids were just okay at this, but there’s a caveat. Only five of Edmonton’s 33 good zone exits (by defencemen) were rushes, and of those rushes Klefbom had two, Davidson one and Nurse one (Sekera had the other). All of these players are comfortable carrying the puck out of the defensive zone, and that’s an awfully valuable skill. I haven’t paid any attention of late about the Coilers. Dead last in the NHL again. Wow. Seriously??? 4 X overall #1 draft picks = 30th in standings. 10 years no playoffs this April. Again. Yup this will take time…. Time to implode this stinky beast, trade 1 or 2 kids and get 2 real Dmen. Or the NHL will change its rules so you cannot waste the careers of more #1 overall picks ever again! I really hope this article will silence the cries to trade Nuge or Klefbom for Hamonic, at least for a little while. This is gold Jon! Keep up the great work! Is there any consideration on the zone entry data given to odd man rush (2 on 1,3 on 2)situations? The offensive team should have a 100% possession entry in these cases. I didn’t track that specifically last night, no, but if one were to do this over an entire season that would absolutely be worth considering. Hey Willis, since 90% of the comments section is pie in the sky trade rumors, usually for guys on defence. Any chance you could start doing some of these charts, or taking a look at some of the upcoming free agent D? Or even some D targets you might think are viable? Possibly starting with Byfuglin. I am curious to know if a Nurse Byfuglin pair only works in my dreams, or could be magic on paper as well. I don’t think there’s enough interest at this point, but depending on where the Oilers are in the standings it’s something I’d consider in the new year. I don’t expect them to buy at the deadline but they’ll naturally be looking at the UFA market. I’d try to do more than this if I was doing that kind of review, though. The above piece doesn’t touch on dzone work without the puck or offensive ability at all, really, and I’d like to get a feel for those things too if I’m going to review pending free agents. Fair enough, I’ll keep my fingers crossed that maybe in the new year you take a look at the free agent D crop, as that’s where I think the Oilers find that final piece that sets our D core for the next 5 years. This is where you will find your annual Nikitin, Ference, Fayne, Sekera contracts. Two are either scratched or in the minors, one of them is a depth defenseman and only one plays a large amount of minutes We have 4 really good Dman and need to continue developing them. Top pair Dman aren’t picked up on the waiver, or free agent signings, they are drafted and developed. Defensively we are better than last year . Offensively we are about the same , or slightly less with McDavid out of top 2 lines . 3rd and fourth lines are crippling us offensively early this season . In close games bottom two lines are costing us greatly , and have been a huge disappointment up till now . They are not only not scoring , but not being good enough defensively either . Yak may not be a great option on a second line , but we have a dire lack on bottom six to replace him . Wow, it’s looking like a pretty strong free agent D crop this summer, assuming everyone makes it there. I think there is a real opportunity to either just buy the top end right side D man, or make a huge upgrade on Schultz on the second pair right side and have a strong top 4 d by committee, with Nurse and Klefbom basically improving. Names like Yandle, Byfuglin, Faulk, Yannick Webber, and Ben Lovejoy are just a few I’m throwing out there. Also Dan Hamhuis will be on the market. I know he shoots left, but if the Oil pull the trigger on like a Klefbom for Hamonic trade, well then there’s some pretty good names that could shore up the left side as well in the summer. Justin Faulk would be incredible. Fingers crossed he hits the open market. The Oilers have 15 points after 21 games and to be in the hunt they will need to be playing .500 hockey at the halfway point of the season. They will need to win 14 of the next 19 games. Mathematically it works like that, but in practice I don’t think it does. Case in point, the Wild from last year. They were like what 15 points out of a playoff spot before Dubnyk, then went on that huge tare. I think if the Oilers are like 10 points out of a play off spot by the time the get McDavid back, anything is possible. The team isn’t built to win 14 of 19. This isn’t the year. Right on captain obvious! So what do you think? Would you actually care to comment on if you think this team can do it?? Or are you just gonna sit on the fence? Very interesting information. By my eye I certainly have noticed better positioning and quicker reactions when moving the puck in the d-zone. One of the most frustrating things for me with the old regime and even at the beginning of the season is the constant chip off the glass and out because it never seemed like there was a player in the right position to take a pass or support another one going for a puck battle. Also on loose pucks lost by the opponent you used to always see the player who was supposed to go for it would pause for a split second and either take a look around or hold off, unsure if it was his responsibility. While this still happens a lot, I have definitely seen the Oilers D and forwards too much better in the zone providing the support and going to where they need to be. Exiting the zone is now much smoother and the number of fire drills we are stuck in for shifts on end seems to be going down. I like the controlled entry stats, and controlled exit stats, but when I’ve read them elsewhere, they include the forwards. So let’s say Lander or Letestu. How are they part of a controlled exit, especially since they get the majority of defensive zone starts. Likewise, this stat can be applied to the Oilers forwards. How often does the Hall line enter the zone in a controlled fashion, versus dump-in versus turnover at the blueline? But I commend Willis for tracking these. It is an awful lot of work for one person. They really need a stats team tracking these. They probably do already, but it’s not available to a shmoe like me. Great article as always, JW! Do we have any comparables, to put these numbers in the context of good D vs. Bad D? Or is this stat an innovation? Did the Oilers play a more aggressive style of defense yesterday? It seemed to me they were on the Caps much tighter in the neutral zone than in previous games. If so, I like the change. I’ve been reading this site for 4 years, (first comment was only last month), and this is BY FAR the absolute worst thread I’ve ever seen. I think the nation is slowly being driven mad by the losses. Attacking Willis, NAS constantly writing novellas, attacking each other. Everyone have a beer and chill the f*** out. At the end of the day, fandom aside, this is a game and we are supposed to enjoy it. Chill, breathe, relax. It will be ok. BTW, great article Willis! I honestly had to check a lunar calendar to see if tonight was a full moon after reading this comment set. Nope, just your regular run-of-the-mill Oil-lunacy. (tomorrow night is the full moon – should be some really awesome threads…). Liked the article JW, and liked what I saw on the ice last night. There weren’t many times last year I could say the latter – in fact this was about the time I started checking out last year. Continuous improvement until Conor gets back and then an exciting second half of the season is all I’m looking for. There are very few stats for Defencemen and I found this very intriguing and likely valuable information for a player and/or coach. Couple questions, are there name’s for these metric’s or is it just zone entries and exits and do NHL teams use these stats? How many times does a defensive pairing manage a controlled exit? Since they don’t do it by themselves, how are forwards supporting that controlled exit? How many times enter the offensive zone in a controlled fashion? With the controlled entry, how many shots or high danger scoring chances result? It’s another way to look at efficiency of the team, and which players are playing well. But it really works better evaluated over time, so that you’re seeing progression or regression. Like the Davidson stats. Was it a one-time thing, or is he showing progression towards a top-4 role? I have no clue on whether NHL teams track these, but given the number of advanced stats personnel on various teams, I would guess they do. Newagesys, or how to spot a guy who just got laid off. Good read! Ty for the article. 1st – JW, great article. 2nd – I am tired of the whining that goes on. Am I sick of losing – Yes. Did we wander in the hockey death zone for years with NO HOPE OF IMPROVEMENT – Yes. Was it the OLD BOYS CLUB OF INCOMPETENCE – Yes. So I understand why people want to whine about the past as there was no future in that regime. That was then and this is now. 3rd – I see a MARKED DIFFERENCE NOW both the players and the staff. Did we expect to make the playoffs this year – No. Is the team SUBSTANTIALLY MORE COMPETITIVE – Yes. Did we lose a lot of players to injury/sickness that has slowed our progression to making the playoffs – Yes. 4th – I’m excited. Not because we will make the playoffs or win the cup this year. Because WE CAN WIN ON ANY GIVEN NIGHT AGAINST ANY GIVEN TEAM – despite the injuries/sickness. The TEAM HAS STRUCTURE AND COMPETE. Haven’t been able to say that in a long time. Our MOST TALENTED AND DYNAMIC PLAYERS ARE OUR YOUNGEST – the future will only be better. We have GREAT COACHING/GM. We have a GENERATIONAL PLAYER. We will soon be a team others WANT to play for rather than the obverse. WHEN WAS THE LAST TIME YOU WERE ABLE TO SAY ANY OF THAT? Are we winning, not yet but IMHO we are definitely turning the corner. Doesn’t the ‘h’ in ‘imho’ stand for humble? This sounds more like a strong opinion.